On Sunday August 23rd, I was ready for a full day in the field after not having birded the day before - with my first stop at Jones Beach. When I pulled into Jones Beach, at the Coast Guard Station I was the only one around. As I listened to the sounds of birds around me I marveled at how peaceful it was…just how I like it. I scanned the spit off the station and quickly began counting Red Knots, Semipalmated Plovers, Oystercatchers, Short Billed Dowitchers, Rudy Turnstones and other birds. 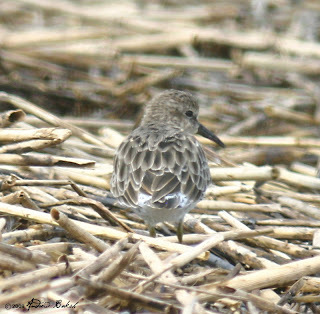 After, scanning for about 30-40 minutes, other birders showed up with one guy indicating that he had a Baird’s Sandpiper at another location called the Swale. My interest immediately peaked and I decided to leave for the location that the Baird’s was reported. I was joined by birder Bobby Kurtz, and we both headed out to the location. When Bobby and I got to the swale, we realized that everyone else had followed us. The guy who reported the Baird’s pointed out the bird to us. 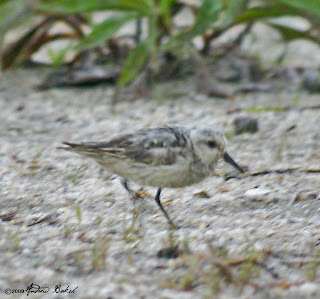 However, when Bobby and I looked at the bird we both realized that it was not a Baird’s but a rather worn and discolored Sanderling. The Swale was swollen from all the rain from the storm and so Bobby and I walked out for a closer look. 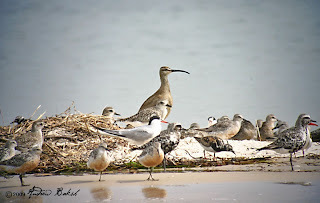 We did not see much and so headed back; on our way, we picked up two flyby Whimbrels, both of them called out by Bobby who was rather enthusiastic in his calls…picture someone shouting really loud…WHIMBREL, WHIMBREL!! 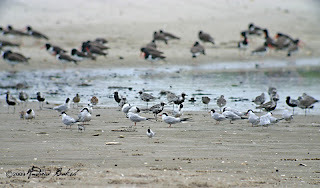 I decided to head back to the Coast Guard Station; once there, I again scanned the spit to see if additional birds were pushed in with the high tide. I was pleasantly surprised to see more Whimbrels and ended up counting 6 for a total of 8 for the day. 1/2 hour later, I was ready to move onto another location, but was undecided on whether I should head East or return West. 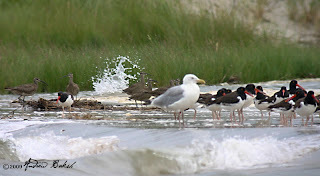 A phone call to my friend Andy Baldelli convinced me to head East and after about an hour’s drive, I met up with Andy who joined me in my vehicle and we headed out to Dune Road to bird while waiting for the tide to subside for a Cupsogue run. It was there that we encountered the mystery bird that caused a bit of a stir that afternoon. Andy and I had stopped along Dune Rd. 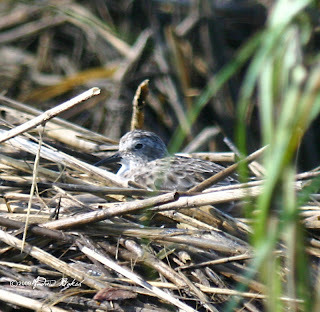 and did a brief sea watch; after leaving the area we were cruising along when we noticed a number of peeps feeding on the shoulder of the road on some reeds that were flattened into the ground. We discussed whether it was worth stopping and looking and after reviewing what we would say should the local enforcement pay us a visit, we went for it. The local police have been rather tolerant to birders, so we take extra precautions to observe the town laws. After securing a spot along the road where we would not be far from my vehicle, Andy and I began scanning the peeps. 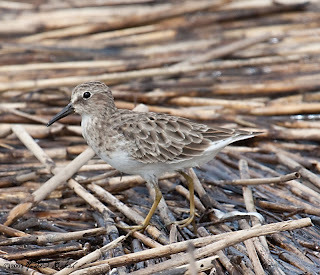 I quickly keyed in on a Western Sandpiper and began to observe and take photos, while Andy continued scanning. There were a lot more peeps than we had anticipated, so it was going to be a while to scan them all. After about a few minutes, Andy called out to me and asked me to look at a bird that he was looking at. I found the bird and asked Andy, what about it. 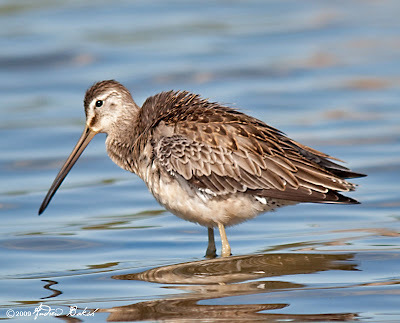 Andy wanted to know if I thought it was an interesting bird, after taking a closer look, I responded that it looked like a Least Sandpiper, but I was not sure because the plumage was strange. Andy responded that is exactly that is what he was thinking. Andy went on to say that he thought we were looking at something good. 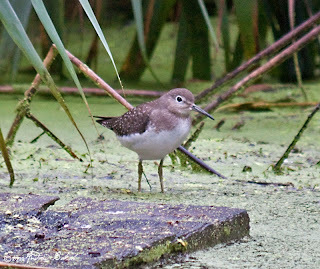 Not convinced, I went back to looking at the Westerns and also White-rumped Sandpipers that I had noticed. Andy after further looking at his mystery bird asked that I stop what I was doing and photograph (for documentation purposes) the bird he was keenly interested in. I did and began looking at the bird closer. 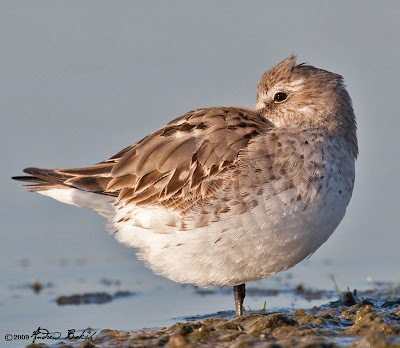 To be honest, the plumage was different, but I was still being conservative and not buying into what was so different about the bird; Andy began referencing Temminck Stint. 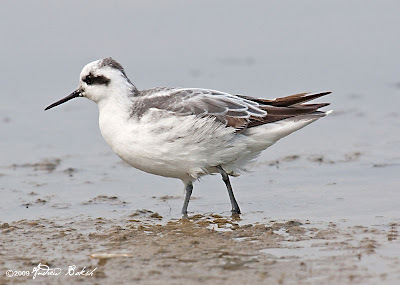 Having no experience with Temminck Stint I deferred to Andy’s experience since he has a whole lot more birding experience and began to think that maybe Andy was onto something. Things started to heat up after Andy made a few phone calls and provided a description to a few birders; he eventually, convinced a few other well experienced birders to drive out to our location to visit the bird. By this time, I started to get phone inquires about the bird and it became difficult to manage the phone and focus on covering and photographing the bird at the same time. A few times I handed my phone to Andy, just so I could focus and not lose the bird before other folks arrived. I tried photographing the bird with my phone in an attempt to send an e-mail to fellow birder Doug Gochfeld for him to take a look, but the e-mail failed and so we waited it out. After about 2-3 hours one birder showed up who got good looks at the bird but was on the fence, neither discounting Andy’s assessment nor taking a position. Other birders soon showed up as well and they too took a neutral position on the bird, neither one seemed willing to make a call. This further fueled the speculation that we had indeed stumbled upon a good bird. Around 6:30 p.m. with light starting to fade, Andy finally got a photo sent to Shai Mitra who again showed why he is considered one of the best in the state. 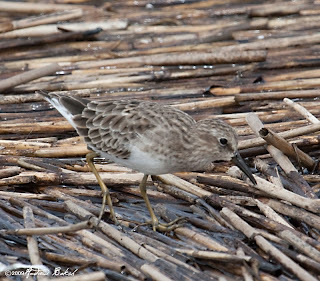 Even with the crappy photo, Shai called back Andy and indicated that the bird was not a Temminck, but rather a Least Sandpiper in a plumage not normally seen on the NE and was the type of plumage that had tripped up other birders in the past to think Temminck. Paul Buckley (another respected birder with vast knowledge in the field), whom Andy was trying to get hold of all afternoon, finally got back to Andy just as we were leaving the area. 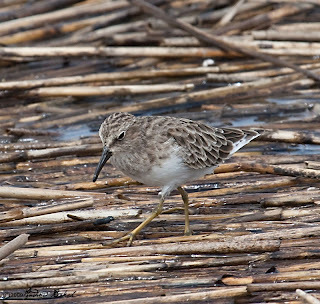 After listening to Andy’s description of the bird, he concurred with Shai’s assessment in that the bird was a Least Sandpiper. After getting home late that night (around midnight), I spent several hours getting a few of the best photos out a small group of people including Shai Mitra, Angus Wilson another top NY state birder and Kevin Karlson (co-author of The Shorebird Guide). They all agreed with the initial assessment by Shai. Of course, we were both disappointed in the outcome…Andy more than I for sure. It was a learning experience for me and I am grateful that I was there with Andy who handled the entire event with poise. Andy and I received a lot of support from many respectable birders/photographers including Shai Mitra, Paul Buckley, Lloyd Spitalnik and Angus Wilson. Angus showed what a top class individual he is by writing a lengthy public note thanking Andy and I for staying with that bird until help arrived. It was not the bird we hoped it would be, but I would not trade the excitement and experience that I gained from being right in the middle of what could have been a record first NY State find. 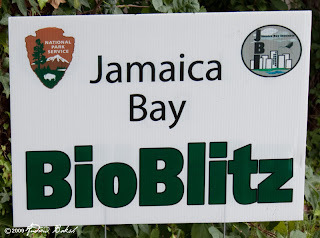 I put off a day of birding in the field to volunteer my time on Saturday at the Jamaica Bay BioBlitz that was held at Floyd Bennett Field in Brooklyn NY. This event, was concentrated around the Floyd Bennett area only and when I was asked to participate, I agreed to do the birding part of it. Somehow, I worked birding in...nice don't you think? 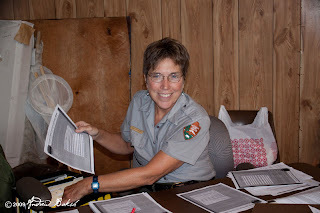 My friend MaryJo, one of the nicest NPS Rangers around. I arrived for my shift which began from 7:00 AM - 3:00 PM and joined four others - later we were joined by another participant. Together we headed out to the North Forty trail. The moment we hit that trail, we were ambushed by hordes of mosquitoes and those of us who had not applied repellent were left scrambling to get some sort of protection. These mosquitoes were hungry and they were relentless in their attacks; in the beginning some folks were just covered with the buggers as they attempted to penetrate clothing too. It was so bad, some ended up with welts the kind you see after a paintball game. Nevertheless, the group weathered the assault and we covered our area without any losses. The birding was slow with not much around; nevertheless, we birded on, covering our area until it was felt we had given enough blood and settled for 42 species, with the highlights being 4 Solitary Sandpipers and a female Scarlet Tanager. 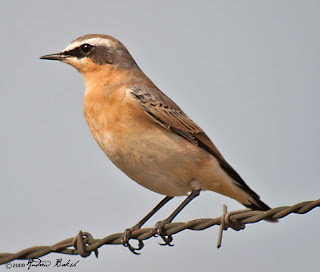 I was not planning on going for the Northern Wheatear (Oenanthe oenanthe) in Connecticut until I found out the directions late Saturday night. Subsequently, I packed my gear and prepared for an early morning run the next day. The next day could not not arrive quick enough as I was wired for the run. After sucking down a light breakfast, I was on my way. 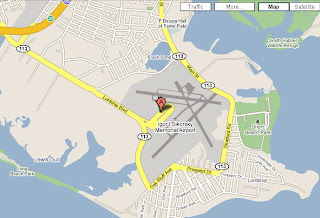 The directions were spot on and I arrived around 8:50 AM at the Igor Sikorsky Airport. By 9:00 AM, I had my first looks of the bird. I stuck around until 11:30 AM, enjoying the looks, taking field notes and capturing several photos. 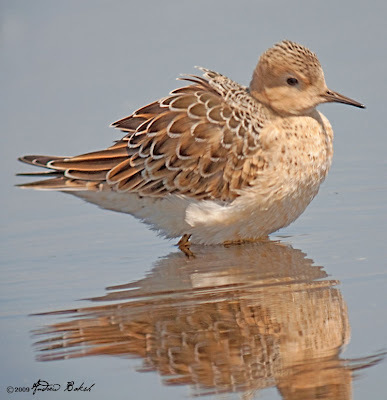 This species breeds in Alaska and remote parts of northern Canada. 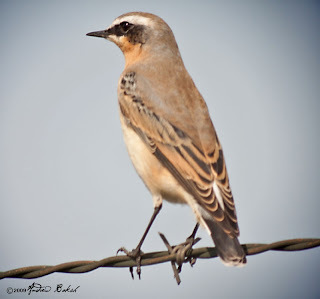 Without traveling north the best chance of seeing this bird is in the northeastern United States from late-September through mid-October. 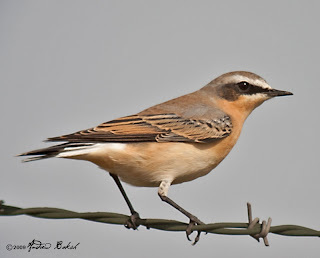 I consider myself lucky to get this bird here...enjoy the photos. A planned trip to Delaware was put on hold for the weekend and so I ended up visiting the East Pond at Jamaica Bay on August 22nd for a quick spell of birding before it was off to work on a friend's computer...UGH (what was I thinking)! 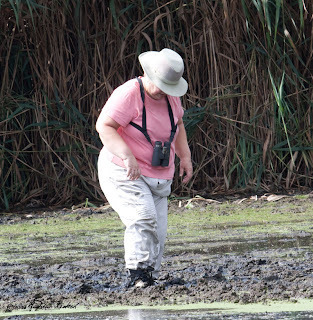 Initially, I thought I had gotten there early, before anyone else; however, as I walked out on the North End of the East Pond, I saw birder Peter Chen and his two kids already on the mudflats. 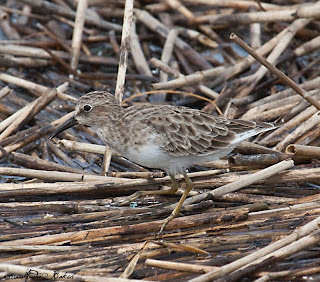 When I caught up to Peter, he keyed me on a Sora (Porzana carolina), along the edge of the phragmites. It was a pleasant surprise to see this elusive bird feeding oblivious to our presence. 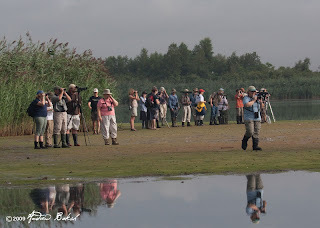 After looking at the Sora for a few minutes, we were joined by several groups of birders. 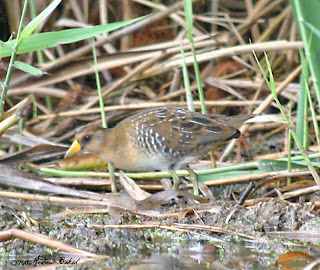 Despite the crowd the Sora stuck around and we were able to pass the word out; I believe most people that arrived around that time saw the bird. 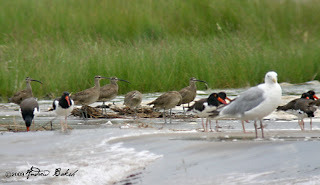 Among the groups were a number of birders/bloggers that were out on a Jamaica Bay walk. The only one from the blogging group I knew was Corey Finger who I have birded with. Eventually, I did get to meet a few of the bloggers/tweeters including, Christopher from Picus Blog, Ann Marie also known by her twitter handle as iheartwarblers, Beverly Robertson from Behind the Bins and Catherine Hamilton from mydogoscar. 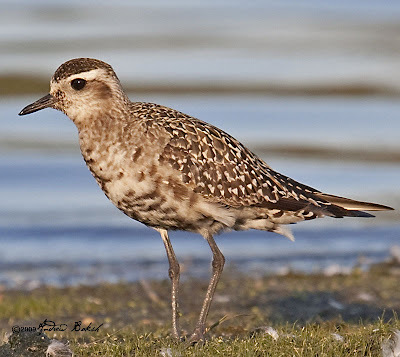 Since, I knew Beverly Robertson had expressed her desire to land an American Golden Plover, I tried hard to find the one that was seen there a few days ago. Alas, it was not to be a Golden Plover day for Beverly as it appeared that the bird was no longer around. By then, it was time to leave and so I reluctantly left Jamaica Bay, but not before getting a few photos, including one that captured a visitor who got stuck in the mud around the dreaded cove. 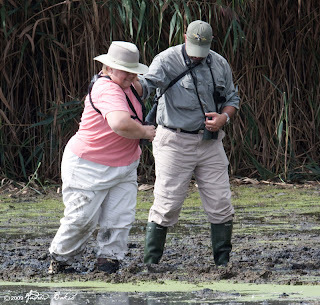 My hats off to Christopher from Picus Blog, who was a total gentleman in being the only one who ventured out into the mud to help, while other birders walked right by her. They, no doubt fearing their own demise if they stopped to help. Luckily, with Christoper's help she made it out of the muck. Of course, I did nothing to help either; instead, I seized my chance to get a few photographs of the moment. Oh dear, I am stuck...maybe I should not have come this way. Never fear, Christopher is here. A gentleman to the rescue.